'Rogue filmmaking'- From inside the tea cups and outside of the nostrils, getting tossed as Carrom on the broad or plunging camera across the beach as a ball, requires RGV's creativity although it was a complete distraction in some sequences But But you cannot ignore the creativity and the challenges put through . For some this is a real pleasure to watch such a challenging medium of communication where the camera is always on the roll. The free styling camera may give a nauseousness awareness sometimes and sometimes may deliver as a punch across your face. You will wonder on the cinematic peak of the visual language where RGV repeatedly and mercilessly destroys all conventions of cute storytelling and aims for the jugular vein. As breaking rules is what RGV stands for. And, I know he will never stop challenging the regulars and second-handers. 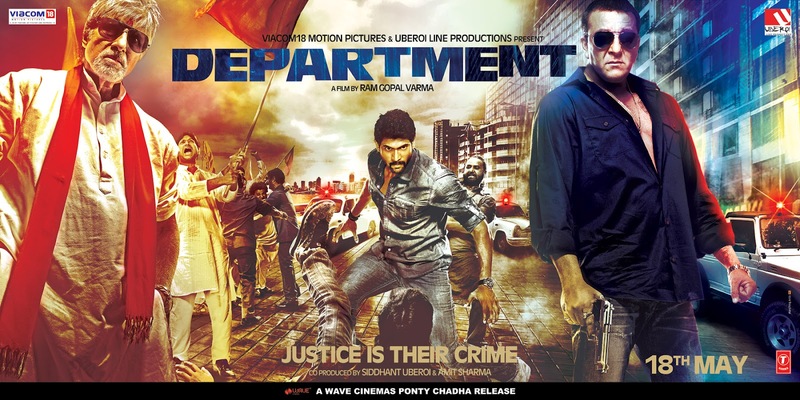 Department has a much better gripping story line than the recent Bollywood like Kahani, Agent Vinod, Houseful2 ,Ishqzaade, Agneepath etc. Although not a nice experiment with new bizzarre camera angles, where RGV completely goes Rouge. There are scenes which might have worked good on a normal 50mm. There wee too many close crops. It was also nice to see a director of this stature using Canon5D and 7D for the shoots using multiple cameras at a time. A tight editing by Vinay Abhijit gave a new look to bollywood. it was previously tried in 'Not a love story' but came full on in department. The story has a penchant of RGV where he excels. Power and fight for power. From the police department to the underworld to politicians , right from Satya, Shiva, Company,Sarkar, he has a tight control on the narratives. This time he has gone to fist fighting more than the gunshots, which ruined the whole concept of killing a gangster. If you wanted to kill someone why to throw punches and then take your pistol and shoot in the end, do it at the beginning itself. Like always said - "when you have to shoot , SHOOT." The gun blazing scene at blind school shootout was not required and later converted in to fists was a lack. The scenes were little exaggerated but the masala was packed for titular pleasure. So was the unnecessary songs, esp the item number where Nathalia kaur was uncomfortably shaking the booty. and the whole dancing crowd vanished once the shots were fired. RGV should have kept the plot by no to item numbers, better female selection and a better music director (Bappi Lahiri, Dharam-Sandeep, Vikram Magi). Raunchy lyrics and a loud background score was another unnecessary. The female moll -Madhu Shalini was a complete waste and I wonder about the casting credibility of the director. Why he always fails in this department, all his heroines right from Urmilla, Nathalia, Antara, to Madhu has this round faces and sleazy tongues. 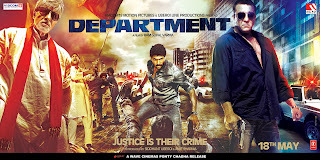 Even Mrs Sanjay Dutt (in the movie) played by Lakshmi Manchu was given some loud words not those of a elite police class. The conversation between husband and wife was really uncalled and gave a chauvinistic classless feel. Although Lakshmi was better than Anjana Shukhani , who was another dumb doctor in this flick of RGV. It also shows that Lakshmi brings a better screen presence from her American television stints. Like understood, RGV gives strong characters to his male protagonists. Right from BigB to Sanjay Dutt to Rana Duggubatti to Abhimanyu singh. Sanjay dutt with his sulken eyes was a perfect cast for an aging mature rouge police officer while Rana with his too straight face was another rock cut honest fresh cop. Rana stands tall among Bachhan and Dutt, still he needs to bring more wrinkles on his face for a close crop 70mm silver screen. Amitabh was in sarkar's persona preaching Hindu epics and comparing himself with Gautam buddha. The portrayal of grey politician with blend of philosophy brought new vividness to this movie. The subtle screenplay to bring the tout thrill on the screen was amazingly good and the central theme of the movie. Vijay raaj was good as a local don, but Abhimanyu as DK was completely wasted as a BABY, and RGV failed to utilize the venomous eyes this time. Deepak Tijori with kohl eyes and a Hogan-ish mustache was a surprise but lost its factor over the time. Nilesh Girkar had a good story and ended with a hope of Department 2. RGV, Everybody wants you to bounce back, just make sure you have a better female selection and a better music director. The story was taut and thrilling. Not for front stalls and neither for multiplexes.